How You Heal: Herbs, Remedies, and Elixirs. Anti-Aging Herb with a 5,000-Year Track Record. Panax ginseng is perhaps the world�s best-known herb. Popularly employed to increase energy and stamina, it has been used medically in Asia for more than 5,000 years. In China, ginseng is more valuable than gold due to its seemingly miraculous properties of restoring health. The name panax is related to the word panacea, which means �cure-all.� Scientists in the West have confirmed ginseng�s efficacy in various traditional uses. Commonly considered an �adaptogen,� ginseng enhances body functions and the immune system to help people adapt to the negative effects of physical and environmental stress. Ginseng helps improve coordination and reaction time as well as increase endurance and decrease fatigue. It boosts energy gently, rather than stimulating the central nervous system, as coffee does. There is also strong evidence that ginseng can help the body fight off infection, protect liver and heart health, normalize cholesterol and blood sugar levels, regulate the function of hormones, and improve memory and cognitive functions. People taking ginseng often report overall improvement in well-being. Thanks to widespread cultivation and abundant supply, this truly remarkable anti-aging herb is available to and affordable for people all over the world. Pain, especially chronic pain, is the number one reason that people refrain from exercise. Yet exercise is critical to one�s longevity. Your healing plan should include treatments to resolve the underlying cause of the pain as well as an effective pain remedy. White willow bark contains salicin, a compound found in aspirin�in fact, aspirin was originally discovered in and extracted from this bark. Besides its pain-relieving property, white willow bark is an anticoagulant, which helps prevent formation of blood clots and thickening of blood that can lead to heart attacks and strokes. A major advantage of using willow bark over its pharmaceutical cousin, aspirin, is that it does not cause gastric upset and erode the stomach lining. Of the ten top-selling drugs in the United States, three are specifically for indigestion and heartburn. That�s because we live in a culture marked by poor diet and digestion�and the poor health and short life span that go with it. You�ll find many tips in this book for practices that can help, such as controlling your weight, eating smaller meals, chewing thoroughly, reducing stress, and avoiding coffee, cigarettes, alcohol, and deep-fried foods. In addition, taking certain common, easily available herbs on a regular basis can prevent or relieve digestive problems. Peppermint has many well-documented properties: it increases healthy gastric secretions, relaxes the intestines, soothes spasms, settles the stomach, and alleviates gas. Ginger, also extensively studied, has been shown to soothe the digestive lining and balance gastric juices. Chamomile is another excellent herb for settling the stomach. You can combine the three herbs, steep them as tea, and drink it at mealtimes. Why does hearing wane as we age? Blood supply to the auditory nerve diminishes, and neural conductivity to the brain declines. Eastern medicine has long used acupuncture to increase blood flow to the auditory region and normalize conduction, which can alleviate tinnitus (ringing in the ears) as well as hearing loss. Can�t find an acupuncturist? You can take steps to improve your hearing on your own. Daily cardiovascular exercise will boost hearing function by increasing circulation overall. The supplement niacin, or vitamin B3, helps dilate capillaries, promoting blood flow to the tiny blood vessels in the inner ear that feed the nerve. Another B vitamin, choline, is essential for the body to produce a key neurotransmitter, acetylcholine. Good sources of niacin and choline include legumes and beans, especially soy beans, wheat germ, whole grains, avocado, brewer�s yeast, peanuts, leafy greens, and fish. Dr. Mao (as he is known by his patients and students) is a 38th generation doctor of Chinese medicine and an authority in the field of Taoist anti-aging medicine. After receiving two doctorate degrees and completing his Ph.D. dissertation on Nutrition, Dr. Mao did his postgraduate work at Shanghai Medical University�s affiliated hospitals and began his 20-year study of centarians of China. Dr. Mao returned to Los Angeles in 1985 and has since focused on Taoist anti-aging therapeutics at his Tao of Wellness Center. Looking and feeling young for decades is not just the province of the wealthy and surgically enhanced. Living to be 100 is simpler than most people imagine. 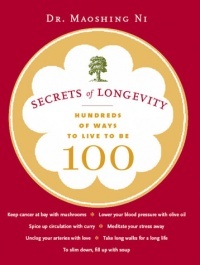 In Secrets of Longevity, Dr. Maoshing Ni shares the secrets gleaned from 38-generations of medical knowledge in his family, and a 20-year study of centenarians in China. A longer, healthier and happier life is not a result of a complicated supplement regimen, arcane dietary restrictions or any particular exercise, rather it is a combination of simple approaches to all areas of life. Dr Mao (as he is known by his patients) shares the main areas in which small changes can have a big impact on longevity and general health.